MAXX Mass Gain Fuel [High Molecular Weight Maltodextrin (Polysaccharide), Fructose (Monosaccharide), Waxy Maize (Polysaccharide), Inulin], MAXXPRO Protein Matrix [Whey Protein Concentrate (CFM - Cross Flow Microfiltered 80%), Milk Protein Isolate (80% Casein, 20% Whey Protein), Whey Protein Isolate (CFM - Cross Flow Microfiltered 90%), Micellar Casein (Non-Denatured)], MAXX Amino Matrix [L-Glycine, Creatine Monohydrate, L-Glutamine, Creatine Ethyl Ester, BCAA Blend (L-Isoleucine, L-Valine, L-Leucine)], MAXX Lipid Matrix [Sunflower And/or Soy Powder, MCT (Medium Chain Triglycerides) From Coconut, CLA (Conjugated Linoleic Acid)].Cocoa Powder, Natural And Artificial Flavors, Xanthan Gum, Cellulose Gum, Carrageenan, Acesulfame Potassium, Sucralose. Contains less than 2% of the Daily Value of Vitamin A, Vitamin C and Iron. Not a significant source of Vitamin A, Vitamin C and Iron. 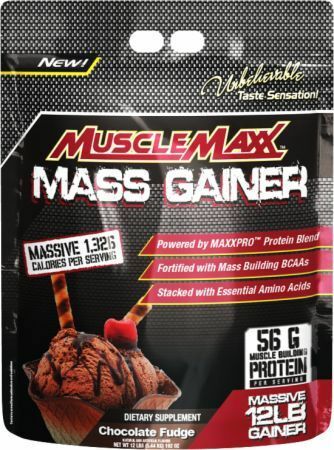 Take MuscleMaxx™ Mass Gainer immediately following your workout. On days that you do not workout, take upon waking. Mix 2 to 4 scoops of MuscleMaxx™ with 12 to 24 oz. (355 ml to 710 ml) with either water or milk depending on your preference. Use only as directed. Store in a cool, dry place (16 C to 27 C). Keep Out Of Reach Of Children. MAXX Mass Gain Fuel [High Molecular Weight Maltodextrin (Polysaccharide), Fructose (Monosaccharide), Waxy Maize (Polysaccharide), Inulin], MAXXPRO Protein Matrix [Whey Protein Concentrate (CFM - Cross Flow Microfiltered 80%), Milk Protein Isolate (80% Casein, 20% Whey Protein), Whey Protein Isolate (CFM - Cross Flow Microfiltered 90%), Micellar Casein (Non-Denatured)], MAXX Amino Matrix [L-Glycine, Creatine Monohydrate, L-Glutamine, Creatine Ethyl Ester, BCAA Blend (L-Isoleucine, L-Valine, L-Leucine)], MAXX Lipid Matrix [Sunflower And/or Soy Powder, MCT (Medium Chain Triglycerides) From Coconut, CLA (Conjugated Linoleic Acid)].Natural And Artificial Flavors, Xanthan Gum, Cellulose Gum, Carrageenan, Acesulfame Potassium, Sucralose.